The British government announced this month that all dogs must be microchipped to make it easier to trace the owners of dangerous animals to ensure that people are held accountable for their animal’s behavior. 1. Which word best describes the type of literary device the cartoonist is using? 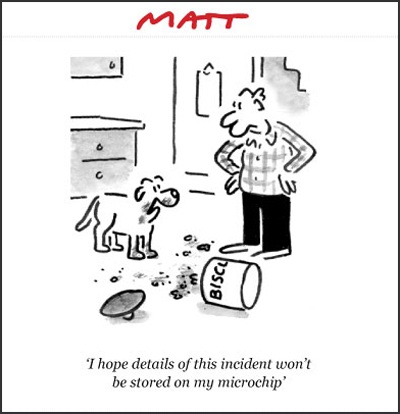 Cartoon for London's Daily Telegraph by Matt. 2. Personification is a figure of speech in which human characteristics are attributed to an abstract quality, animal, or inanimate object.